We love it when aesthetics marry with function and provide a visually pleasing device that also performs exceptionally well. The Minuskull falls beautifully into that category from what we can tell. It’s a fun piece of home or office art that doubles as a speaker. The design, as the name would suggest, resembles a cartoon skeleton head. One look into the hypnotic eyes and you’d be forgiven for thinking you were looking at a speaker designed by Tim Burton. 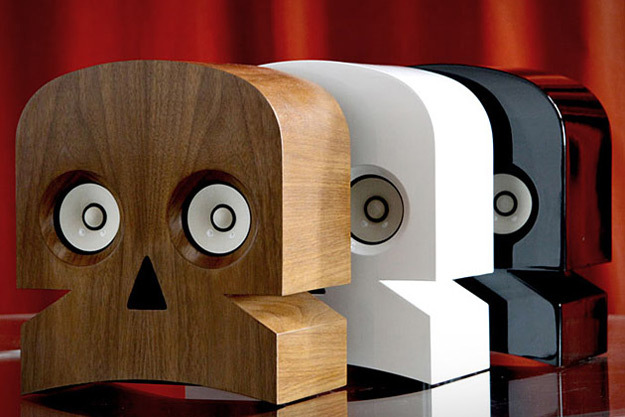 The Minuskull speaker is available in three different finishes, black or white piano lacquer, and warm walnut. It features two broadband Fostex FE-83 speakers and a mini subwoofer in its skeletal dome. The speaker skull also contains a tailor-made 50W Mosfet amplifier — ensuring a transparent and dynamic listening clarity so these spooky-speakers never miss a beat. Of course, what good is a speaker system, especially one costing around $2,150, if you can’t plug it in and enjoy it with all your digital music? Thankfully the Minuskull features a pair of RCA-style connectors that serve as inputs. It can connect to any source of sound, MP3, iPod, laptop, and for those with deeper pockets, five or more Minuskulls can combine to make one incredible spooky and expensive sound system.